Everyone loves giving and receiving new beauty and personal care products as holiday gifts. They're the perfect choice to provide a little extra holiday sparkle, try out a new trend, or break out a look for the upcoming new year. As part of the POPSUGAR Insights 2017 Holiday Report, we asked 3,000 US women to tell us how much they plan to spend on beauty and personal care this holiday season and how their beauty product usage behaviors change during the holidays. Overall, 64% of millennial women said they plan to spend "about the same" this year on beauty and personal care holiday gifts as they did last year. Seventeen percent said they intend to spend more. One in five younger millennials said they intend to spend more this year. When thinking about beauty and the holiday season, millennial women say they "look forward to trying new beauty products" (25%), they "love giving their friends and family beauty gifts" (22%), and they "wear more makeup during the holidays" (21%). 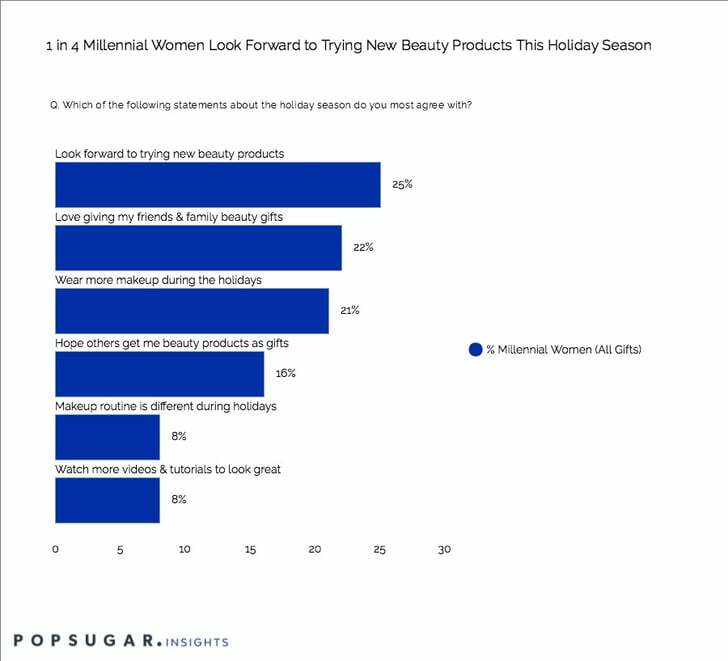 Sixteen percent of millennial women said they "hope others get them beauty products as gifts" for the holidays. In terms of specific beauty and personal care products, millennial women are likely to purchase cosmetics/makeup (57%), skincare (50%), fragrance (43%), and haircare (36%) products as gifts this holiday season. Younger millennial women are more likely to plan to purchase cosmetics (61%) than millennial women overall.